If I am fishing tiger nuts at range I favour a stiff link, which ensures there are no tangles on the cast. My preferred hook link is ESP Ghost Fluorocarbon which has great refraction properties. Again I use a knotless knot approach and simply mount the nut off the back of the shank. 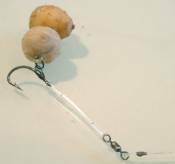 Critically balanced baits on stiff links do not work quite in the same manner as a braid set up, so I often use a popped-up approach when using stiff links. The picture here shows my normal popped up fluro rig, which has one artificial floating tiger nut and one normal tiger nut. One of each type means the weight of the hooklink is just enough to hold bottom, if not, a small piece of putty can be moulded around the link. With regard to freebies, I tend to use a mixture of whole tiger nuts and lots of crushed up pieces. These can then be dropped over the bait if stalking or fishing at close range, or can be placed in a PVA bag if fishing at range. I often use a mixture of hemp and crushed up tiger nuts, used in liberal amounts this mix can be used to devastating effect on waters where boilies are the norm.